About a year and a half ago when I had just started working as a contractor at Mannatech, I was asked to write a script for a new message of the month series that the company was launching. I didn’t know a lot about the company yet, but I did a lot of online research and found as much printed copy as I could to get a feel for the place; at that point, I was fairly prepared to begin my assignment. But before I began actually writing, I took one more important step. I prayed. Now, I don’t believe God cares specifically about the success of the company where I work, but I do know He cares about me and that he wants me to come to him about everything and anything. So, I prayed, “Lord, this is an important project for me. Please just help me do my best and be my best.” And He did. I was told that I “hit it out of the ballpark.” After that, I went on to write the rest of the scripts for the year. And I follwed the same preparation process each time, successfully. And each time I prayed in that way, asking for what He wanted rather than what I wanted, things began to happen. So, when the job offer from Mannatech came, I knew I was in the right place. I love what I do, and the great thing is that I can still do the other work I enjoy on the side. He really did know what was best. Now a full-time employee, I have seen several management changes and a whole new redirection in our company focus. My department plays a key role in creating new materials that will help bring a more cohesive and comprehensive message to the market. So, suddenly, we had a HUGE project that would have a big impact on the whole company, and, of course, we only had a short time to pull all the copy together to meet a printing deadline. Whew! Nothing like a little pressure. For about a week, I worked through my lunches, worked late, took work home, and worked over the weekend. There was one other writer who helped on this project, but still, there was a lot of compiling, writing, editing, and rewriting going on. I was slightly overwhelmed, but I wasn’t worried. Every time I began to work on this project, I prayed before I started. When I was done, I felt confident that I had produced quality work. But how would management feel? Our Director of Marketing read through everything today (Tuesday) and when she came to talk to me, she said, “Nina, this copy is rock solid.” Awesome! 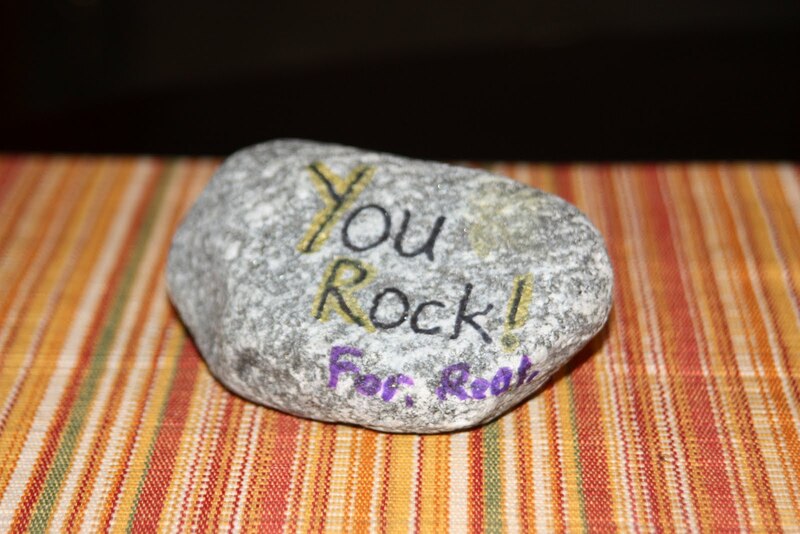 Of course, in my mind I couldn’t help but think it was actually “Rock” solid. Because even though this wasn’t a life or death situation, I can still say, “On Christ, the solid Rock, I stand” no matter what issue I’m dealing with, even if it’s just doing my job to the best of my ability. Are you Rock solid? Did you ever think that God just wants your attention, and if the only time you talk to Him is when you are having problems, He just might keep allowing problems to find you? Why not try this instead: “Come near to God and he will come near to you.” (James 4:8) It’s His promise. Draw close to God every day, about everything – good or bad. He wants to hear from you. 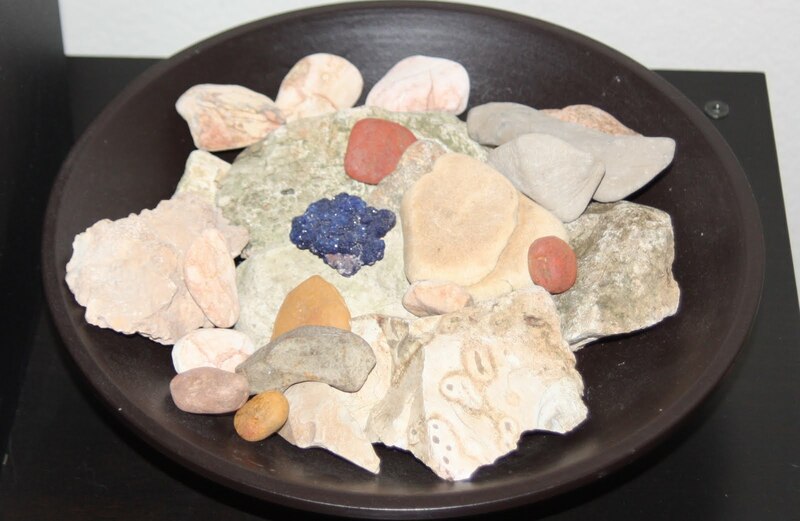 The top photo of rocks is from my collection. I like to pick up interesting rocks and stones from different places Bart and/or I go. I think I just may look at them in a different light from now on, as a reminder of the solid Rock I stand on each day.